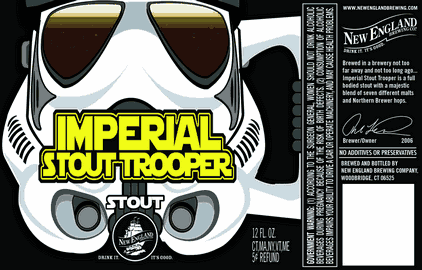 New England Brewing Company has announced (as happens so often, I heard via beernews.org) that it will be releasing the Imperial Stout Trooper Stout. Actually, it'll be released this Saturday, on Dark Lord Day. I assume this label is by their marketing company, Heavybag Media, whose portfolio is an interesting blend of punchy and creative. If nothing else, the New England Brewing Web site is worth a stop. 1) Redundant in name, 2) Not high art, and 3) Awesome. Yes, I'm a geek. Not as big a Star Wars geek as most, actually, but I still like it. Look, great design does not need to be cerebral; some of the best work communicates its message quickly and humorously, and doesn't need to be layered and complex. This is one of those pieces. They even somehow made the storm trooper helmet look like aviator glasses from the warden in Cool Hand Luke. Good, solid stuff.